A National Public Radio report blamed global warming for wildfires in Texas and suggested the best way to put fires out is by "getting real" on climate change. "It's Been A Bad Year For Texas Wildfires," reported KUT in Austin Tuesday morning. "It Will Probably Get Worse." The public radio station claimed four recent wildfires in Central Texas are part of an "uptick in fires" that "bares the fingerprints of climate change." NPR quoted Geeta Persad, a climate scientist, who said climate change is "partly to blame" for 100-degree weather, which is far from an anomaly in Austin. But Donald Falk, an ecologist and part of University of Arizona's "Climate Justice Network," places greater weight on global warming and said the only way to fight wildfires is by "getting real and confronting climate change." "I feel very confident in saying Texas is in the bull's-eye of climate change," Falk said. Citing Falk, NPR reported there is "only one big way to prevent forest fires." "The lesson from our research is very, very clear," Falk said. "You cannot fix the fire problem without getting real and confronting climate change. Period. End of story." However, in the aftermath of the Bastrop County Complex Fire, which destroyed 1,700 homes and killed two people in 2011, Texans said they learned another way to prevent wildfires: prescribed burning. And NPR reported on it. "In Bastrop's Ashes, Officials Find a Lesson in Prescribed Burning," NPR reported at the time. The report noted that burn bans were not effective in preventing wildfires. Larry Joe Doherty, the president of the Prescribed Burn Alliance of Texas, told State Impact, a reporting project of NPR, burn bans were "useless." "The wildfires that sprung up, they had no respect for the counties' burn bans, they happened anyway and they're going to continue to happen," Doherty said. 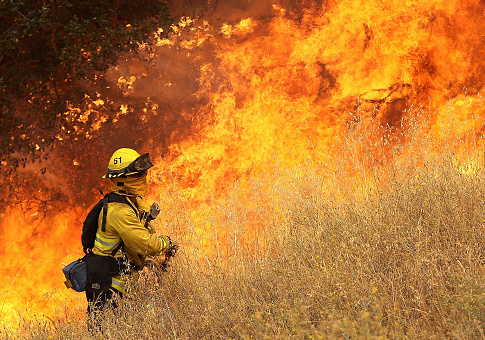 The solution, instead of "getting real" on climate change or burn bans, was controlled burning of dry grass and brush. "Burn it on your own terms, they say," NPR reported at the time. "Burn it under expert guidance before it builds into fuel for a wildfire of epic proportions like it did in 2011 in Bastrop County." This entry was posted in Issues and tagged Climate Change, Global Warming, NPR, Texas. Bookmark the permalink.